The new digital economy is changing the face of the data center industry. And the data centers of the future will likely look very different from facilities opened just a few years ago. Some of these changes involve using innovative energy technology, such as data center microgrids, to cut down on risk and improve efficiency and reliability. To highlight some of these changes in detail, businesses are shifting away from internal data centers, and third-party colocation providers are taking a front and center role to cover the growing data needs of today’s companies. 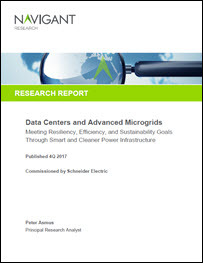 A new report commissioned by Schneider Electric and conducted by Navigant Research, “Data Centers and Advanced Microgrids: Meeting Resiliency, Efficiency, and Sustainability Goals Through Smart and Cleaner Power Infrastructure,” was published in the fourth quarter of 2017, and explores the implications of the meeting of data centers and energy solutions like advanced microgrids. To today’s data warehouses, resiliency is key, which is one reason they are incorporating microgrids. Microgrids also are being discussed to provide energy security. “Given the risk profile of data center operations, it is paramount that if a data center operation wishes to outsource its energy asset management tasks to a third-party, it chooses wisely,” the report states. Advanced microgrids can be a good fit for the high-tech data industry, as these tools incorporate the latest hardware and software innovations to meet today’s data center resiliency requirements — at a lower TCO — according to the Schneider Electric report. The digitization of products and services is dependent upon reliable electricity. Today’s data centers are trying to make their operations more resilient and efficient through tools like the cloud and the virtualization of energy services. And this is creating the perfect environment for new technologies like advanced microgrids to flourish. Data center microgrids might be the wave of future energy solutions for the colocation industry. In fact, this environment is setting the stage for creative solutions providers to offer up new technologies via new business models that can mitigate risks while increasing performance — through options like data center microgrids. 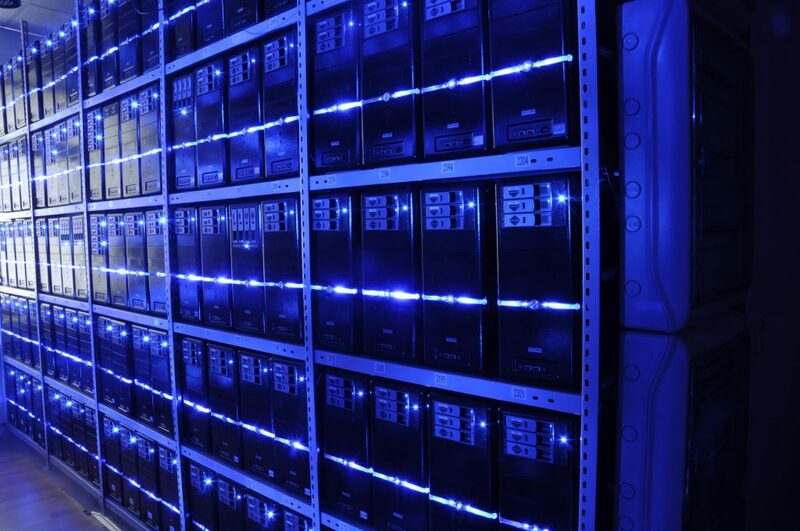 According to the report, data centers are emerging as a new target for energy innovation. Data centers also have been known as “pioneers” in corporate sustainability. For example, Apple has switched to 87 percent renewables or clean burning natural gas for powering their data centers. And according to data from the report, that number shoots up to 100 percent for companies like SalesForce. Ultimately, data center microgrids might be the wave of future energy solutions for the colocation industry. This white paper explores the implications of this transformation on the data center industry. 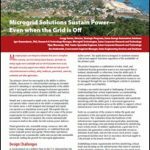 Download the full report from Navigant Research, courtesy of Schneider Electric, “Data Centers and Advanced Microgrids: Meeting Resiliency, Efficiency, and Sustainability Goals Through Smart and Cleaner Power Infrastructure,” to learn more on how energy solutions like advanced microgrids are a good fit for data centers.